Calling all flower children, hippies and tree huggers! Flock to Gulfport's waterfront and bring your buds for a day of peace, art and music! Gulfport invites you to the 17th Annual Geckofest, celebrating the end of summer. GULFPORT, FL: Calling all flower children, hippies and tree huggers! Flock to Gulfport’s waterfront and bring your buds for a day of peace, art and music! 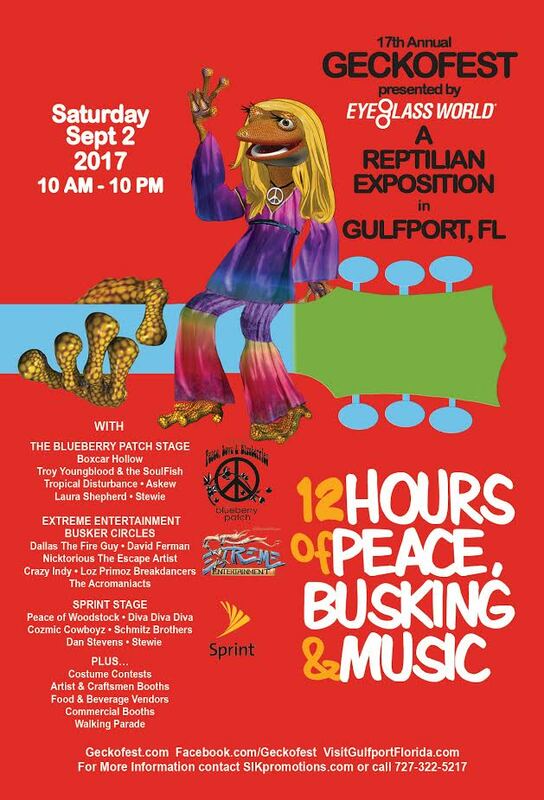 Gulfport invites you to the 17th Annual Geckofest, presented by Eyeglass World, celebrating the end of summer with its largest festival of the year, honoring this waterfront village’s unofficial mascot and favorite reptile, the Gecko! Drag out those bell-bottoms from the back of your closet and get groovy at “Geckostock”. Celebrating the 1969 Woodstock Festival and featuring a host of hippie-themed festivities, Geckofest will feature themed, live music on two stages, presented by Sprint and The Blueberry Patch. Shop the vendors, enjoy strolling and stationary street performers, join the quirky walking parade, colorful costume contests, and the ever-popular end-of-the-day dueling street dances that wrap up this light-hearted send-off to summer. It’s going to be far-out and outta sight, man! Additional “Gecko-World” activities include; A Gecko Art Show and Reception on Friday, August 4th, a Gecko Bar Crawl on Saturday, August 12th and the Gecko Ball on August 26th. Parking and admission to Geckofest is complimentary and the event is pet and family-friendly. The Gulfport Trolley offers visitors who park in designated off-site locations transportation between their vehicle and the festival site at no charge. GetGO, Gulfport’s 5 passenger electric vehicles, will also be available to pick up residents or visitors and deliver them to their desired destination with no parking worries!